Unlock Your Phone: iOS 4.1 Userland Jailbreak Coming Soon? iOS 4.1 Userland Jailbreak Coming Soon? You have been waiting for that! 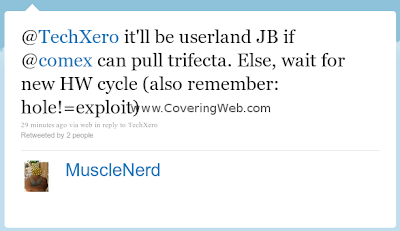 MuscleNerd has just said that comex will try to pull a trifecta by releasing a userland jailbreak similar to JailbreakMe to jailbreak iOS 4.1 for all devices but if he fails to do though, then a iBoot or bootrom exploits will be released. @MuscleNerd I know tons already asked this but is the iOS4.1 gonna be a userland jailbreak as usual or will redsn0w be making a comeback ? There's no ETA but all what we know that the iPhone Dev Team are working hard on jailbreaking iOS 4.1 for all devices. If they failed to do though, they will release the ready-done jailbreak for iPhone 3G / 3GS (old bootrom) and iPod touch 2G / 3G (Non-MC models). For others, you may wait until iOS 4.2 release in November. W595 and C903 3 Network Locked, Unlock done! LG KP105 Sun lock unlocked! Microsoft: Windows Phone 7 is Ready. Set. Go. l a o g s m™. Awesome Inc. theme. Theme images by Dizzo. Powered by Blogger.